It seems very appropriate that I've added this video during the wettest British summer ever recorded (2012), although the song refers more to oppressive heat, rather than the rain. You can see the official video in the playlist on the main Bananarama page. 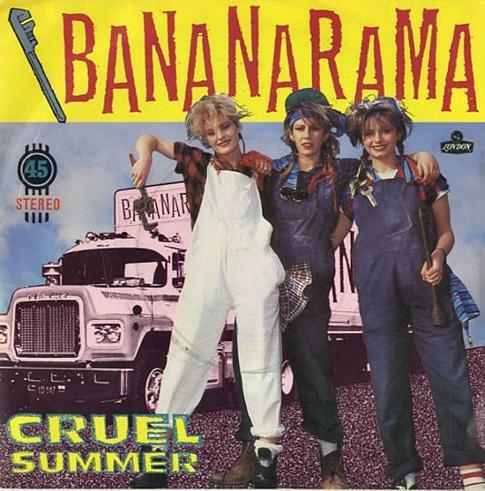 Cruel Summer was Bananarama's first single release to be lifted from their self-titled studio album. It was released in June 1983 in the UK, reaching #8. The song became their first American hit, reaching #9, although it wasn't an instant hit and only became popular after featuring in the movie The Karate Kid in 1984. However, the girls requested that the song should not feature on the film's soundtrack album. The Bananarama album was also moderately successful, reaching #16 in the UK and gaining Silver. On the Billboard 200 the album peaked at #30. The follow-up single, Robert De Niro's Waiting was a much bigger UK hit, reaching #3, but in the U.S. the single flopped, only just making it into the Top 100 at #95. Indeed, the girls had no more American hits from the album.